70pp., 8vo, in 'Campbell's Albany Diary and Almanac for 1900' (Glasgow: Duncan Campbell & Son), 'Printed 2nd September, 1900. Ownership inscription on front free endpaper: 'L. K. Smith | The Royal Scots | 2nd. Bn. Mounted Infantry | 2nd. Cavalry Brigade'. Internally in fair condition, on aged and worn paper, in heavily worn and stained red cloth binding. Entries dating from 1 October 1899 to 26 May 1900. An interesting first-hand account, conveying a vivid sense of immediacy, from an officer who saw a deal of action and distinguished himself during the campaign. It is the most comprehensive archive of military letters that I have come across, physically or in research, covering as it does every phase of Potter's distinguished career - India, Ireland, South Africa, the Sudan, the Great War, Ireland (eventually as "British Military Chief" in Belfast). 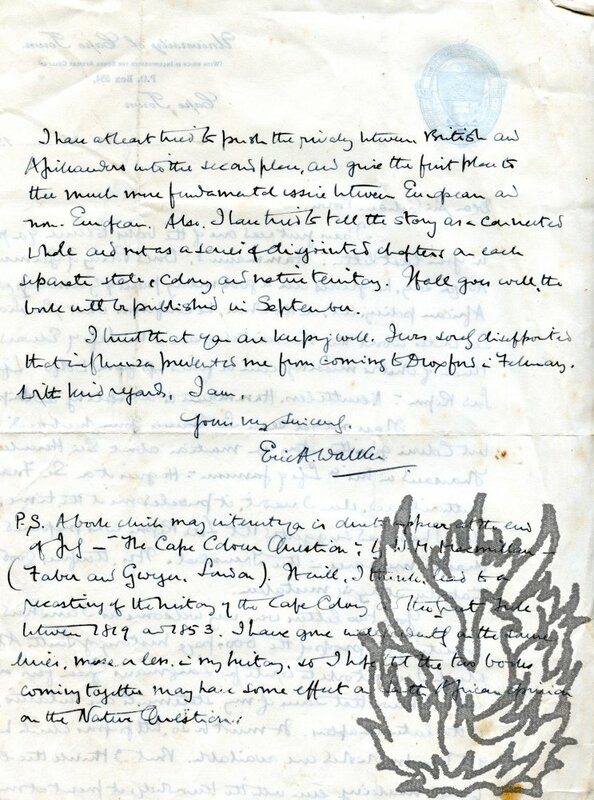 I have selected his Irish and First World War letters to demonstrate that the letters are substantial and interesting, with valuable perceptions and comment. Autograph Note Signed ('Fred Slade') to 'My dear Bee'. 24 February 1899; on letterhead of the Chief Staff Office, Woolwich. 12mo, 1 p. 6 lines. Clear and complete. Fair, on aged and slightly grubby paper, with strip of glue from mount on blank reverse, which has laid down on it a ten-line biographical newspaper cutting referring to Slade ('[...] one of the youngest major-generals on the Staff in the Army [...] His most recent appointment was that of Assistant Adjutant-General at Woolwich'). He is sending 'a missed lot of Soldiers autographs. Some that you already have may be useful in exchanging for others'. 4tp bifolium: 3 pp. Text clear and complete on aged and lightly-creased paper. The first page is headed by the crest of the City of London. 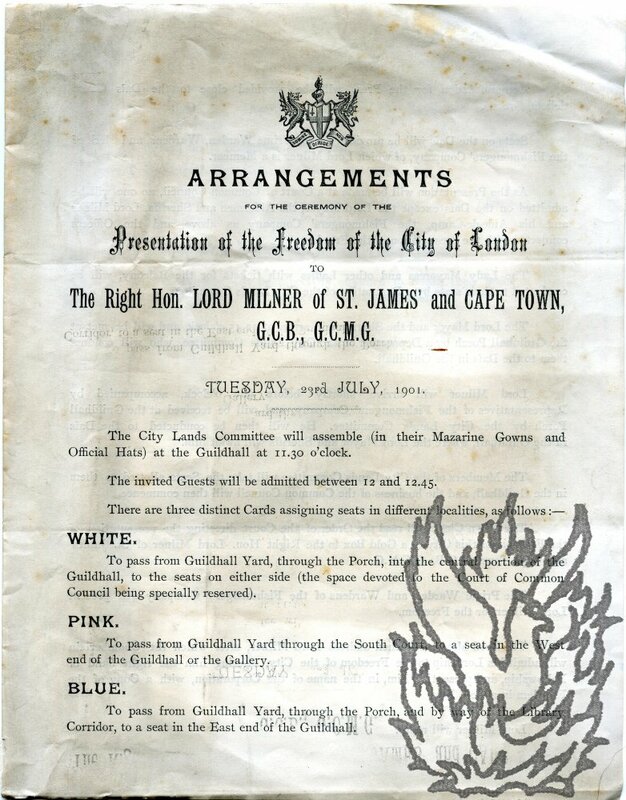 Gives the timetable for the ceremony, and the routes to be followed by the holders of 'three distinct Cards [white, pink and blue] assigning seats in different localities'. 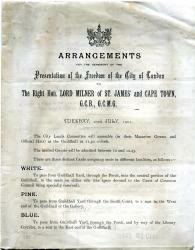 'The Prime Warden and Wardens of the Fishmongers' Company will present Lord Milner with the Freedom. Scrapbook with numerous contemporary cuttings from English newspapers, in the main relating to the Zulu War (1879) and the First Boer War (1880-1881); together with some poetical transcriptions in a contemporary hand. The cuttings are laid down in a contemporary landscape 8vo scrapbook (dimensions of leaf roughly 15 cm x 25), with brown calf spine and marbled boards and endpapers. The scrapbook is worn and loose, but the cuttings, although on high acidity paper, are clear and entirely legible. A unique assemblage, casting valuable contemporary light on the two conflicts from the British point of view. The cuttings, many of them extensive, relating to the Zulu War begin at one end and those relating to the First Boer War at the other. Four Autograph Letters Signed by Florrie Cockle (one signed 'Florrie Cockle (soon Iggulden)' and another 'Willie and Florrie'); one Autograph Letter Signed ('Birt') by Birt Cockle; all to their sisters Kate and Maggie. East London, South Africa; 1898 and 1899. Very good, on aged and lightly creased paper. Six long letters to family in England written during a turbulent period in South African history. Affectionate, chatty, and written from a lower-middle-class point of view (Florrie: 'we always have an h[ou]r., when I change my dress for the afternoon after dinner'). Mostly dealing with family matters. Letter One (from 'Florrie', 4 September 1898, 'P.O. East London, South Africa', 4to: 4 pp): tells an amusing story about Birt, a cart and a goat. 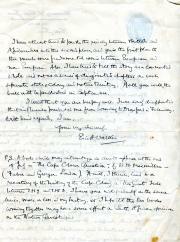 Letter Two (from 'Florrie', 11 September 1898, address as Letter One, 4to: 2 pp). Typed Letter Signed to 'Miss J. Scott Rogers, | Acting Secretary, | Royal Society of Arts'.